We have frequently written about the unsustainable trends in new car sales in the United States created by the combination of lower rates, easing underwriting standards and voracious demand for new securitizations by wall street and pension funds that will do just about anything for an extra 20bps of yield. This week we find that according to the latest Edmunds' data, many of the same problems also afflict the used auto market. The most startling takeaway from the report is that the percentage of used cars being traded in with negative equity values - which means that dealers lenders are willing to accept an immediate loss for new transactions - continues to rise and currently stands at an all-time high 32.4%, up from under 20% in 2009. 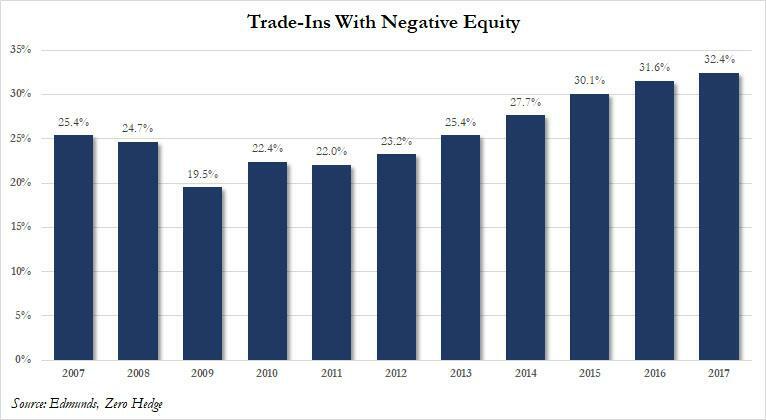 Moreover, the average balance of the negative equity also continues to rise and stood at a record $5,130 last year, up over a quarter from $4,075 a decade earlier. This confirms that banks and finance companies are making riskier loans to keep up revenue as vehicle sales slow. and here's why. The record percentage of underwater loans on trade-ins suggests that car owners are trading in their vehicles sooner than they had previously. According to Bloomberg, "a consumer is often the most underwater on his or her auto loan in the first few years of ownership, because the value of the vehicle drops fastest over that time. By the fourth year, for example, the borrower has paid down a big chunk of the loan, catching up to the depreciation they took in the first few years." As Bloomberg explains, for borrowers who do trade in their underwater cars, lenders are essentially giving them the money to pay down their loan. The dealer sells the used car, and whatever balance remains on the old loan is folded into the new loan. The borrower might get a longer-term loan than he or she had before to help keep monthly payments manageable. That means that loan balances are getting bigger relative to the value of the new car, and the debt will be paid off slower. Confirming this, Moody's analyst Jason Grohotolski notes that the growing proportion of underwater trade-ins means that at least some borrowers are getting deeper and deeper in debt with every car they buy. This will - eventually - translate to bigger and bigger losses on loans for finance companies whenever the economy heads south, the same way lower down payments slammed mortgage lenders after the credit and housing bubbles burst. "It’s this cycle that just continually gets worse and worse," Grohotolski said. "It has to stop, and it doesn’t have a favorable outcome." 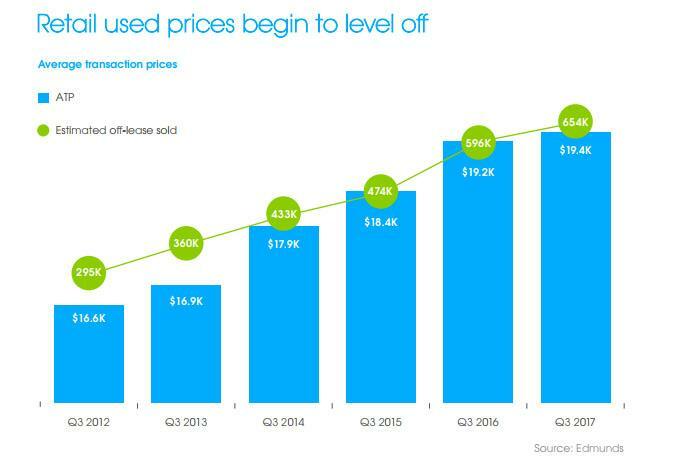 Meanwhile, the average used car price continues to rise and stood at $19,400 as of Q3 2017. This suggests that, since most people simply roll their negative equity into their new loans, many used car buyers are likely sitting on loans where ~15-20% of their outstanding balance simply reflects their negative equity from their previous car. 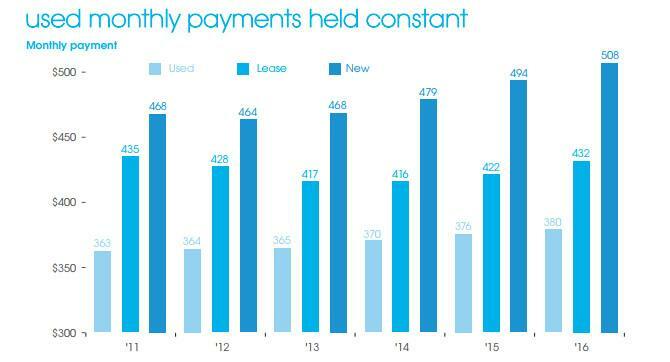 Despite rising average used car prices and rising negative equity, average monthly payments for used cars have managed to stay pretty much flat since Q3 2011. Obviously, monthly payments are determined by 3 variables: beginning loan balance, interest rate and term. While interest rates have (at least until recently) come down since 2011, they haven't declined nearly enough to offset a $2,800 increase in starting principal balance which indicates that, like new car loans, used car loan terms are getting stretched out further and further to manage monthly payments. ... even as loan volumes for new and used car purchases was on track to be higher than ever. Suggesting more trouble lies ahead, Moody's said that the growth in the average amount financed for a new car outpaced median income growth between 2013 and 2016, suggesting borrowers are getting more strained. This can be quantified directly by observing surging delinquency and default rates for subprime auto loans. With few ways to keep the business flowing as demand slows, one staple remains which, of course, is to reach out to less creditworthy borrowers. As a result, delinquencies are soaring for subprime auto loans and in the third quarter reached the highest rate in more than seven years, according to New York Fed data from November. While few deny that the US auto segment, and especially its financing subset is in a bubble, there is broad consensus that unlike subprime mortgages, the bursting of the auto loan bubble will not have dire consequences. In fact, according to a surprisingly rosy take by Bloomberg, "any pain from car-loan trouble will likely be just a shadow of the housing bubble collapse, because the auto debt market is much smaller." There were around $9 trillion of mortgages outstanding at the end of the third quarter, compared with $1.2 trillion of auto debt, the New York Fed said. And so far, many of the bonds backed by subprime auto loans are performing well thanks to built-in protections for investors. Wells Fargo analysts said in a note Wednesday that bonds issued by two of the biggest subprime auto lenders -- Santander Consumer USA Holdings Inc. and General Motors Co.’s finance arm -- have room to reach prices not seen since before the financial crisis. Of course, where this analysis falls short is assuming a linear deterioration once the bubble pops; as the last financial crisis demonstrated, once the waterfall effect of bursting asset bubbles is in play, the fallout quickly turns exponential, and no rational assessment will do the ensuing collapse justice. As such, the real question is whether auto loans will be the trigger for the bursting of the next consumer debt bubble, or just one of the many dominoes to fall. Meanwhile, Wall Street is back to its usual antics. Since auto loans performed relatively well during the financial crisis, it encouraged new lenders to step into the space, according to Dan Zwirn, chief investment officer of Arena Investors. Rrisky car loans can be bundled into bonds and sold to yield-starved investors, who are eager to buy them, and as the chart below shows, that's precisely what is going on. And, according to Zwirn, that also gives cheap funding to finance companies to reach out to riskier borrowers. "The same sorts of excesses are happening in car loans that happened in residential mortgages,” Zwirn said. "Ultimately, when the overall fixed-income market has an issue, even if this is not the cause, car loan debt will likely suffer greatly." And since Zwirn's hedge fund had to shutter a decade ago precisely because it did not envision this particular scenario, Zwirn's caution deserves particular attention..
For now, the stable economy and low interest rates are helping keep borrowers afloat for now said Moody's Grohotolski. But once there is a slowdown, and rates start rising aggressively, lenders will face a reckoning. "We could be in a continued state of risk-building on lenders’ balance sheets," Grohotolski said. "You may not necessarily recognize all of that risk until an unexpected downturn. There could be a meaningful increase in losses." 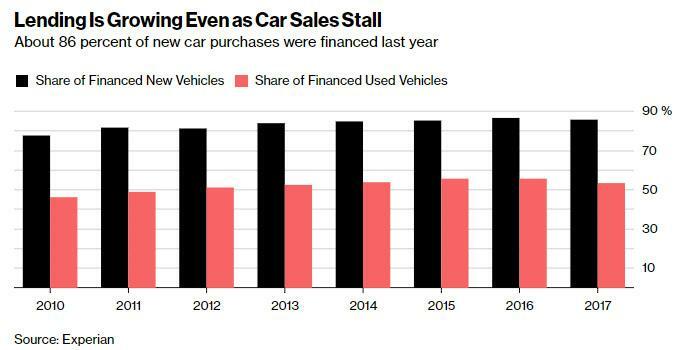 For now, besides the modest decline in total sales and surging delinquencies among subprime borrowers, there are few signs of an imminent storm in the new or used auto markets. 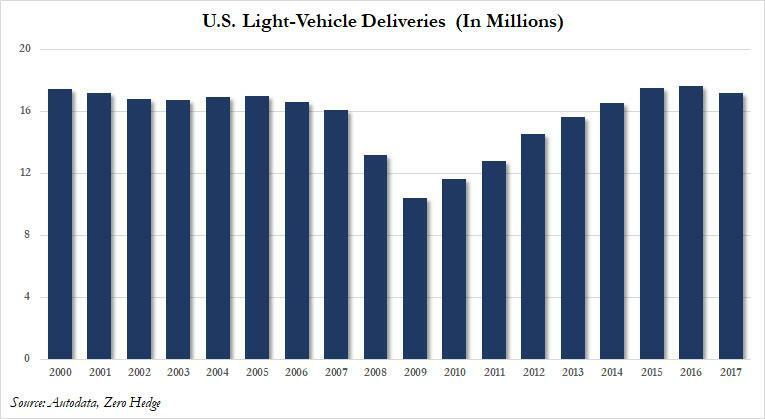 However, chaos in the used-car market - once it accelerates - will hurt OEMs. As we pointed out in June, Morgan Stanley recently predicted that the surge in used-car inventory - driven by a flood of off-lease vehicles - would saturate the market, resulting in as much as a 50% crash in used car prices over the next couple of years which would, in turn, put further pressure on the new car market, which has already resorted to record incentive spending to maintain volumes. What can borrowers do when prices inevitably crash? Last year, the New York Times reported that lenders are increasingly taking delinquent borrowers to court, and winning - garnishing their wages for years for cars that were, in many cases, worth far less than the amount they're paying. For working-class borrowers who are struggling in an economy with stagnant wages, this burden could create serious problems for the household budget, and beyond. It also means that once the current low-rate, credit funded sugar high ends, it will be the middle class that pays for it, as usual.